LONDON (Reuters) – Sterling is likely to gain this year and by the time Britain leaves the European Union next March will have recouped a chunk of its losses since the June 2016 decision to leave the bloc, a Reuters poll suggested. However, the pound is unlikely to re-test the levels above $1.43 it traded at earlier this year, when the Bank of England was expected to raise interest rates in May. Instead, the bank left rates unchanged. The currency is down around 10 percent since Britons voted to leave the EU, trading at $1.34 on Thursday, but some of those losses will be wiped out on expectations for rate hikes and a good divorce deal with the EU, according to the poll. Sterling’s collapse was predicted in numerous Reuters polls before the Brexit referendum. In a month’s time, sterling will be at $1.33, in six months at $1.35 and in a year it will have jumped to $1.41, the June 1-6 poll of more than 50 foreign exchange strategists predicted. Last month the 12-month forecast was at $1.42 and in April – when the BoE was widely expected to raise interest rates in May – it was $1.44, the highest since the June 2016 Brexit referendum. Economists were convinced the Bank would raise rates in May but dovish comments from BoE Governor Mark Carney together with a slew of downbeat data forced them to push those calls back to August in the most dramatic turnaround in Reuters polls history. 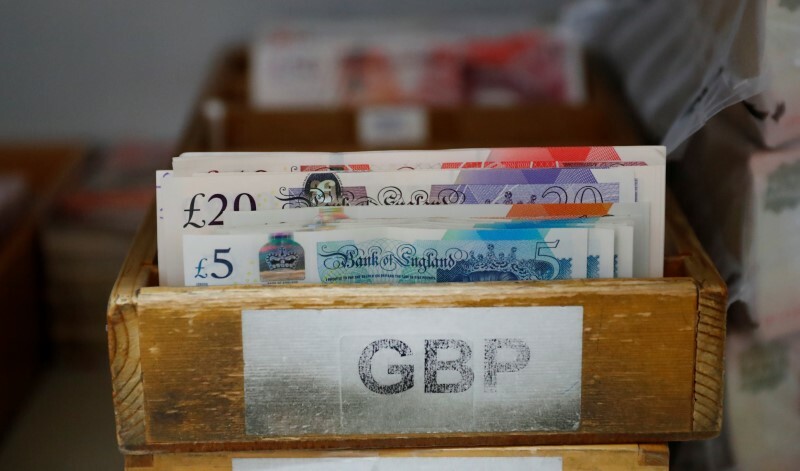 “Although more recent GBP-specific ebbs and flows have been driven by the sharp re-pricing of Bank of England policy expectations, we expect the focus for the pound over summer to shift back to Brexit politics,” noted FX analysts at ING. Uncertainty about the relationship Britain can agree with the EU after Brexit continues to cloud the currency’s outlook. Forecasts for the 12-month outlook ranged from $1.23 to $1.54. Lawmakers will vote next week on Prime Minister Theresa May’s Brexit blueprint. The vote may increase the probability of a “soft” Brexit, helping the pound. But it might also cast doubt on whether May will remain in charge, and her departure would probably weaken sterling. “The lack of safe-haven flows to sterling during the Italian drama highlights belated investor unease about the lack of Brexit progress amidst economic underperformance and BoE indecisiveness,” JP Morgan wrote in a note to clients. Italy is the euro zone’s third largest economy and last month was embroiled in a power struggle between pro-EU politicians and the anti-euro winners of a March election. Better-than-expected business surveys this month have stoked expectations the Bank of England will raise interest rates by 25 basis points to 0.75 percent in August, as was predicted in a May 23 poll. Britain’s economy almost flat-lined at the start of the year, at least in part due to heavy snow, and the Bank will be wanting to see evidence that the downturn was only temporary before it raises borrowing costs. BoE rate-setter Silvana Tenreyro said on Monday much of the weakness in Britain’s economy would probably prove temporary, but the timing of when rates would next go up remained an open question. Turmoil in Italian politics and signs of a slowdown in the euro zone economy pushed the euro (EUR=) to a 10-month low of $1.1510 on May 29. But comments by the European Central Bank’s chief economist that the Bank would debate unwinding stimulus at next week’s Governing Council gave the single currency a lift on Wednesday. Against the common currency, the pound will move little, the survey suggested. On Wednesday a euro (EURGBP=) was worth 87.7 pence and in a year’s time it will get you 88.0p, the poll said.